All the three gospels agree that on the first day of Unleavened Bread, the disciples asked Jesus where he would want to celebrate the ceremony. Matthew said Jesus told the disciples to go into the city and tell someone that he was going to eat the Passover at his place. Mark recorded that Jesus sent two of his disciples on the errand and Luke specifically mentioned that it was Peter and John that he sent. Mark and Luke further recorded that Jesus told the two disciples to go into the city and when they find a man carrying a water jar, they should follow him into the house that he enters and tell the landlord that he, Jesus needed his upper room to eat the Passover there. The man would show them and there they should prepare for the Passover. When it was evening, the disciples and Jesus were gathered for the Passover. As they were at the table, Jesus told them that one of those who were eating with him, was going to betray him. All the disciples were asking whether it was them. All the synoptic gospels agree on this score. Jesus confirmed that one of those who were dipping his fingers into the same bowl was going to betray him. He told them that what was about to happen had already been foretold but woe unto the person who would betray him. It would have been better if that person was not born. 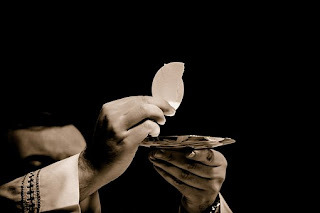 Then Jesus took bread and broke it and gave it to them, saying, “Take, this is my body.” Then he also took wine and after he had given thanks, he said to them, “This is my blood of the covenant, which is poured out for many.” Then they sung a hymn. After that, they left for Mount Olives. On mount Olives, Jesus told the disciples that soon they were all going to desert him in fulfillment of the scripture that “I will strike the shepherd and the sheep will be scattered.” He said later he would arise and go ahead of them to Galilee and wait for them there. Peter replied Jesus that even if everybody should desert him, he Peter would not. Then Jesus told him that, that very day, before the cockerel crows, he shall have denied him three times, but Peter insisted that even if it comes to death, he was willing to die instead of denying him. All the other disciples said the same thing Peter said. 1. a. Narrate the account of the Last Supper. b. How do Christians celebrate the Last Supper today?